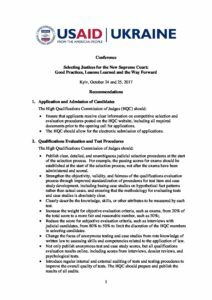 Recommendations from the Conference “Competition to the New Supreme Court: Good Practices, Lessons Learned and Prospects” conducted by the USAID New Justice Program jointly with the High Council of Justice, High Qualification Commission of Judges, EU Project “Support to Justice Sector Reforms in Ukraine” and Ukrainian-Canadian Project “Support to Judicial Reform” with participation of Council of Europe Project “Support to the Implementation of Judicial Reform in Ukraine” on October 24 and 25, 2017. 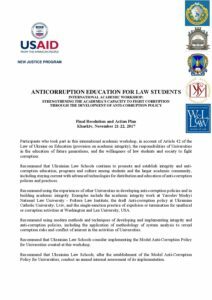 The Anticorruption Education for Law Students Action Plan offers a draft Anticorruption Policy to be implemented by higher educational institutions (HEIs), including law schools. This plan clearly defines what HEI’s corruption is and how different HEI community players (administration, professors, students, etc.) should ensure the prevention of corruption. Additionally, the proposed draft mandates a HEI honor system, discussing its structure, processes, and authority. 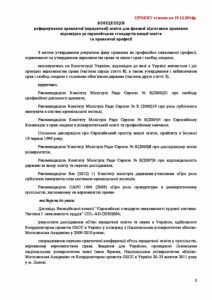 The Draft Legal Education Reform Concept Paper was developed by the Ministry of Education and Science of Ukraine (MOE) Working Group established by the MOE Decree of July 5, 2016. The USAID New Justice Program jointly with the OSCE Project Coordinator supported the MOE Working Group in developing the draft based on European standards, best international practices and expert recommendations as to the role and advancement of the legal profession and higher education in a democratic society according to the needs of the state governed by the rule of law and market economy. The draft went through public presentations and stakeholder discussions in Kyiv, Dnipro, Kharkiv, and Chernivtsi.